syndicate family, originally uploaded by purewestdocs. Finally a moment of rest back at the office, but only a moment! Peter and I got home yesterday, leave tomorrow for a wedding in Indiana… leaving me barely any time to blog at all- and this one’s way overdue! The Syndicate Conference. Wow. Nearly 150 guild members of all ages, colors, sizes, temperments and classes. They took up an entire floor of the Marriott… and what a rowdy bunch! Talk about dispelling every stereotype about gamers (are there even any stereotypes left?) you could find every kind of personality in this bunch. From a couple of fourteen year old members, to a handful of septagenarians, Syndies run the gamut… and are definitely well-versed in the art of the party. We spent the first conference day hanging out in EA headquarters- I should call it a campus, that’s functionally what it is… the Syndie photo above is shot on the quad between employee soccer matches and DJ sets. Yeah, EA seems like a pretty sweet place to work… They toured us around the Ultima Online offices, and had UO devs talk to us about updates to their ancient game. (A game that’s lasted ten years! And its not even a Blizzard game!) One Syndie did an amazing job of kidnapping a dev and talking his ear off, critiquing the game throughout the entire day, which I thought was mean-spirited at first, but later realized was just passionate as hell. Why they didn’t offer this guy a contract at the end of the day is beyond me. Day Two began with the annual Syndicate Conference Meeting- an epic meeting in an epic room full of epic speeches by developers of different studios talking up their games, hoping the Syndicate will take an interest in them… because if they do, it usually means the game is pretty damn good. If the Syndicate doesn’t know MMOs, no one does. Dragons spoke of the progress the guild had made in the past year- mentioning his book THE LEGEND OF THE SYNDICATE, which I read twice, and love. If you have any interest in the history of MMOs and the functionality of an enormous guild, I couldn’t recommend it more highly. Plus, where else can you read about raiding Hooters, and aggroing the waitresses? The meeting was followed up by a brutal paintball game, that ended with one hardy member (read: insane) doing the gauntlet… for those not familiar, all 22 of us lined up firing-squad-style and shot this guy as he ambled along, taking it all, for a long time. When he took off his shirt after the match… well, I’ve never been to war, but it was the nastiest thing I’ve ever seen. Black and blue welts everywhere. Wow. Really, the highlight of the trip were the nights spent in the Presidential Suite with all of the Syndies being boisterous, probably due to the bathtub filled with inebriation juice. Juan and Jackie prepared a ten minute segment on the Syndicate, which ended with a roast of Dragons. The screening of the segment was incredible- a lot of drunken screaming, whooping and clapping- what better reception could you ask for? peter and alice, originally uploaded by purewestdocs. I only have a few seconds before the Syndicate Annual Meeting, followed quickly by the Syndicate Annual Paintball Fest. I thought I’d jot down my first impressions. For those just tuning in, Peter and I are hanging out with 135+ members of online gaming’s premiere guild at their annual conference. The Syndicate’s full roster is over 600, and they’ve been around for 11 years, making them the oldest guild of their size, and one of the very few (the only one?) to have lasted this long. And as they will all tell you, and Peter & I have noticed, its just a huge family reunion. Everyone knows everyone, and they all get along, bicker, laugh, wrestle and drink with mucho gusto. Its a blast being here with them. 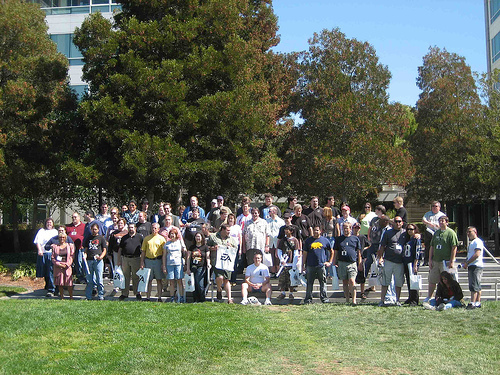 Yesterday we got a chance to tour EA, specifically the Ultima Online division. Was a gamer’s dream come true. 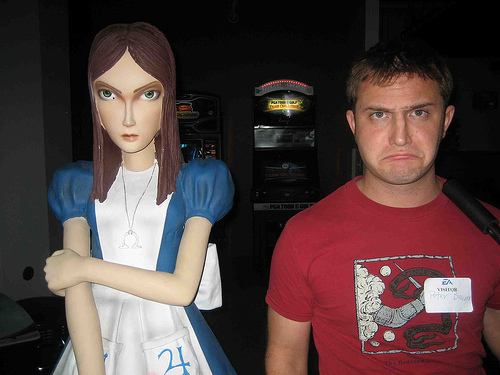 Here Peter feigns misery alongside Alice.